Happy Sunday! Firstly I want to begin by saying an absolutely massive thank you to everyone who took the time to read and comment on my last post- the response was completely unexpected and I was overwhelmed by the positive feedback. I'm genuinely so grateful and feeling re-energised. 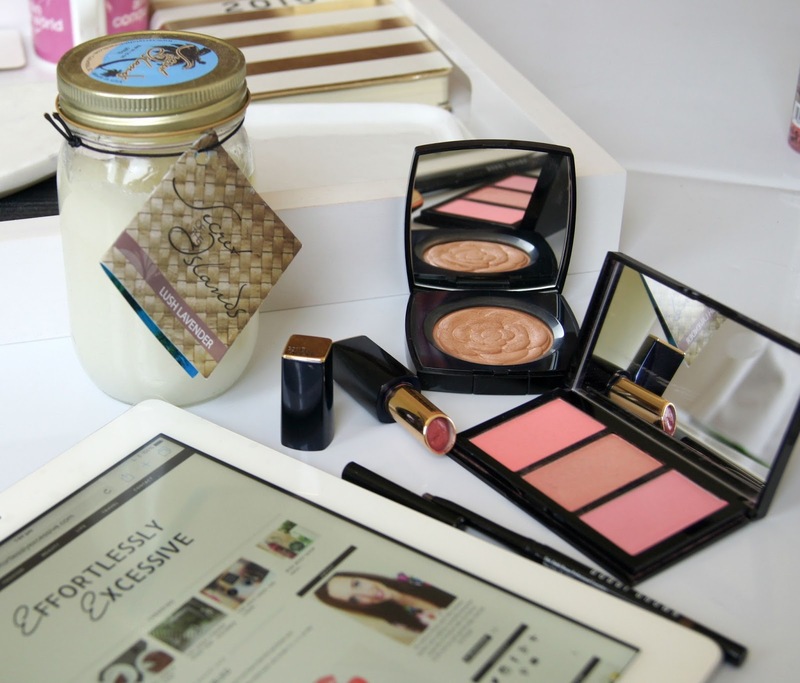 I thought I'd start with a 'currently loving' post to share some of my current make up products. But first, I want to share a blog favourite-Kirsty from Effortlessly Excessive. Kirsty is such a lovely girl and I know we would be genuinely good friends if we lived in the same place. She has the ability to make me laugh out loud with her writing and I look forward to every new post! She's lovely, she's beautiful, she's fricking hilarious and follow her adventures in Finland through her blog, instagram and twitter. She is ace and I am looking forward to seeing if she has any bridezilla moments in the upcoming weeks before she gets married. On to beauty-my first fave is actually something that was limited edition but the two blushers I have been using the most are part of the permanent collection. 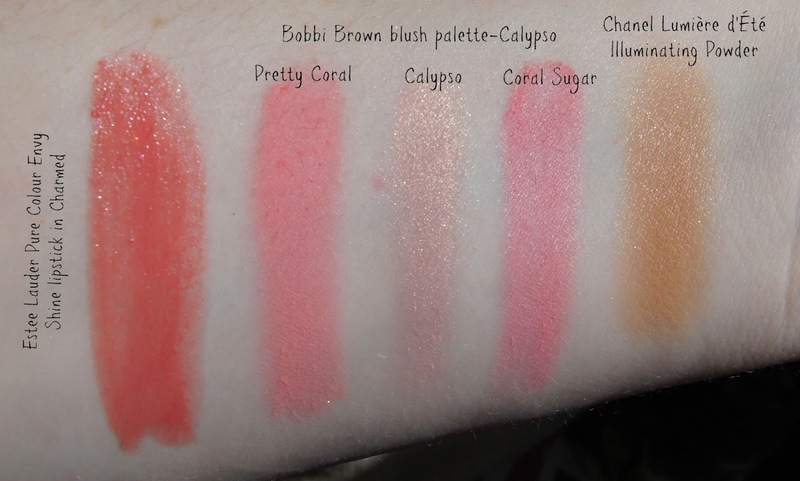 Above is the Bobbi Brown Calypso blush palette which I have pretty much used daily for the past few weeks. Although this is limited edition, Bobbi Brown does seem to launch one each season. It's sleek, light, perfect for travelling and houses 2 blushes and a highlight. Whilst the colours and textures are not unique, it's a well put together and extremely useful palette. 'Pretty Coral' is the shade at the top and is a matte, soft coral peach. 'Calypso' is the highlight colour and runs a golden peach shimmery colour. 'Coral Sugar' is the shade at the bottom and is a lighter, more pinky coral with a satin finish. I find the two blush shades really easy to work with on my pale, cool toned skin. They blend easily, aren't chalky and last all day. The highlight shade lays pretty much unused by me as I feel it runs a little pink on my skin but on a tropical beach, with a pina colada and a light tan this could definitely work. It's quite unusual to find me raving about Bobbi Brown-I don't buy a lot from the brand these days. I used to buy tons but I just found I was over underwhelmed with everything I bought so I steered clear for a while. But something I do really like and reach for most days at the moment is their Perfectly Defined Gel Eyeliner in the shade Scotch. It has a twist up and very small nib making it very easy to line the lower lash line which is my favourite way to use it. Although marketed as a gel eyeliner, I feel its more akin in kohl-but when you apply it, it's on for the day. Scotch is a warm brown with fine gold glitter running through it but it's perfectly acceptable for daytime wear. The Chanel Lumière D'Été illuminating powder is my next favourite and is sadly again limited edition but I have been using it every single day and I can't not mention it! I wasn't interested in this until I saw Blanche's post on her blog, The Beauty Bloss (another recent blog obsession) and then I had to track it down. I went to every Chanel counter in Dubai Mall and every counter had it on display but no stock. But I had that beauty blogger fire inside me to track it down and I put out some feelers to my beauty obsessed friends and Tasha found it online for me-3 seconds later it was bought. I am so so glad I did as this is the most beautiful bronzer. The texture of the bronzer is light as air and it really livens up the skin with a gorgeous bronzey glow. If I want a light glow I use a large fluffy brush, if I want more full on St Tropez bronze* I use a denser, short bristled brush. It never looks too much, too orange or too shimmery. It's a powder yet it doesn't feel like a powder-there is absolutely no powder kick up in the pan when you put your brush in. It's not a matte bronzer by any means and has extremely finely milled shimmer running through it when I swatch but the shimmer doesn't translate to the skin. In fact, really speaking it's undetectable on the skin but yet it does everything. I think it's the most perfect bronzer I have ever used. The thought of hitting pan gives me palpitations. If you see a rouge one of these in store or online I urge you to buy this. Or buy me another one! My final favourite is really random but so good. When Mike and I were in the States, the day we left Vegas we decided to go to Hoover Dam and we drove through a tiny town called Boulder City. We were starving and decided to stop at a little diner for brunch. After brunch I used the bathroom and there was a big bowl by the sink filled with a salt scrub. There was a little note instructing you to scoop up a spoonful, massage your hands for 1 minute and then rinse. I did and holy shitballs my skin has never ever ever felt so smooth and soft. I kept saying to Mike 'feel my hands, just feel them!'. They sold it in the diner in glass jars and that is what you see above. I bought the last two jars and sent one to my mum in the UK. When she received it I made her give me a live action demonstration over Skype to see her first impression lol! It's by a company called Secret of the Islands and they only ship to the US and Canada but if you can get it, do!! They do loads of amazing scents and you only need a tiny bit. Both Mike and I are absolutely loving it and I keep telling him off for using too much! What are your current favourites? Have you used any of the above products?